The sequel to The Legend of Spyro: A New Beginning and the second of a trilogy, The Legend of Spyro: The Eternal Night sees the return of Spyro the Dragon and the continuation of the story that was left hanging in the previous game. 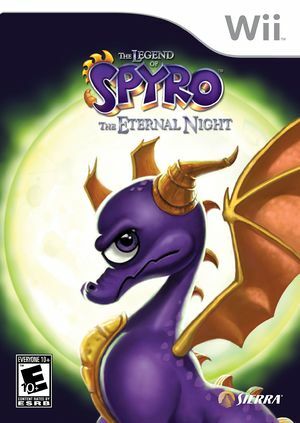 The gameplay of The Eternal Night is similar to its predecessor; Spyro must travel to the end of a level in a linear fashion and defeat the boss at the end of each level, defeating enemies with his combat moves. However, there is a much larger emphasis on exploration and puzzle-solving. No shadows are visible when using Direct 3D, see issue 9155. Use OpenGL to resolve. Real Wii Remote disconnects during gameplay. Fixed at least since 4.0. The graph below charts the compatibility with The Legend of Spyro: The Eternal Night since Dolphin's 2.0 release, listing revisions only where a compatibility change occurred. This page was last edited on 18 April 2018, at 18:23.